BOSTON – It seems fitting that Victory Brewing Company out of Downingtown, PA would win the inaugural Brew Madness competition hosted by brewbound.com, given their name. 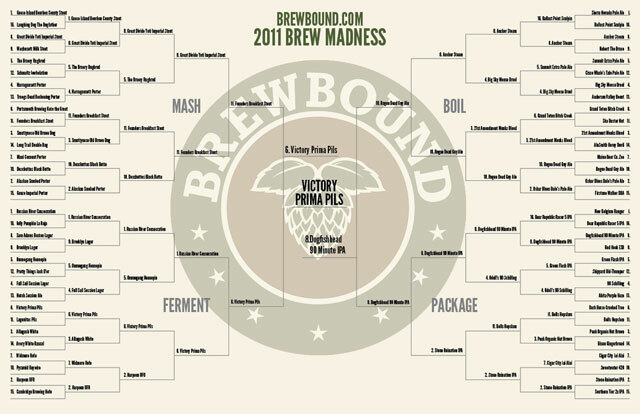 The road to “Victory” was not easy, but Prima Pils was able to fend off some worthy competitors with the help of fan support throughout six voting rounds. 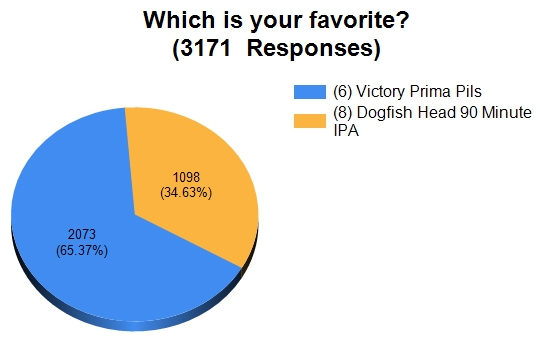 In the first round, Victory Brewing narrowly escaped Lagunitas’ Pils, winning by just 19 votes. Victory then went on to defeat Allagash’s White and Harpoon’s UFO in the subsequent rounds. Once the brewery hit the elite eight, they really began pouring on the voting and Victory fans turned out in great number to help them upset Russian River’s Consecration 522-178. It was more of the same in the Final Four, as Victory took down Founders 413-136 without a problem. Their prize? Squaring off against the national powerhouse Dogfish Head. The brew madness championship, much like the actual NCAA championship proved to be too much for one competitor to handle – in this case Dogfish Head. Through extensive social networking on sites like facebook and twitter, Victory was able to rally the support of their fans and defeat Dogfish Head’s 90-Minute IPA by a score of 2073-1098. Victory Brewing didn’t just walk away with a sense of pride. For their efforts they will receive a year of free advertising space on the brewbound.com website. Brewbound will host the March Madness inspired tournament again next year and will be looking for fan submissions. Stay tuned for more information in 2012!